Many terminators are interested in the quality of Internet in Tajikistan. Unlike other post-Soviet states, the quality of the internet connection is poor here. The main problems are lack of infrastructure, as well as climatic and geographical conditions of the country (mountainous terrain and lack of communication in most of the country). Since fixed links have never been developed at the appropriate level in Tajikistan, the Internet is hard to access for the majority of users. And, despite the fact that 11 providers share the market now in the country, access to a global network for the average user is not a cheap pleasure. According to research, with a population of 8 million 352 thousand, about 35% (2.8 million people) use the Internet for. Most of them are young people, aged between 16 and 35 years, mostly men, living in large cities or regional centers of the country. According to official figures, of 2.8 million users, 980,000 (35%) prefer “Babilon-T”, 504,000 (18%) - "Telecomm Technology", 336 thousand (12%) – “Eastera”. 420,000 (15%) prefer “Intercom” and “Saturn Online”. All other 140,000 (5%) use the Internet provided by other operators. All 11 providers compete with each other in such major cities as Dushanbe and its suburbs, Tursunzade, Kurgan-Tube, Khujand, Nurek, Kulyab, including Khatlon and Sughd regions. In addition, VoIP termination requires mandatory Internet speed of about 64 Kb/s for one channel of the gateway. Fortunately, providers offer different packages focusing on Internet download speeds. To do a successful termination, you should place 8-32-port multichannel equipment in different cities. In this case, the speed of the gateway must be from 512 Kb/s to 2,048 kb/s. Of the plurality of packages from the Internet service providers, the cheapest one is "Dastovard 3" ("the New Dastovard" group), from "Telecom Technology". The cost of connection and monthly fee is $4.96. Until recently, the company has been a leader and monopolist in the telecommunications sector, had the highest coverage in the country. Therefore, many users are connected through this provider. At the same time, when you connect to this provider, there are failures of the wired Internet observed sometimes because the company pays little attention to the old ways of communication and focuses on the new fiber-optic and satellite systems. Users report a better ADSL that "Intercom" provides. The provider offers the best package, taking into account the upload speed of 2048 Kb/s. 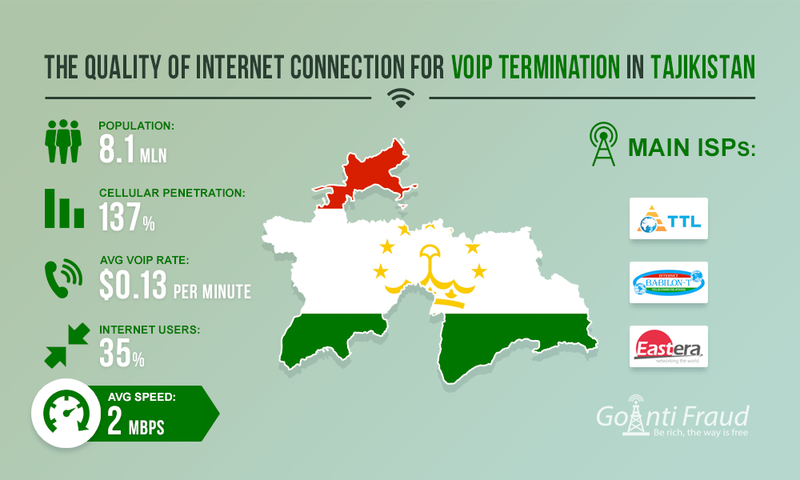 This is the best option for VoIP termination in Tajikistan and installation of multi-channel gateways in the country. At the same time, the user gets 5,000 MB of Internet traffic a month. At the same time, experienced terminators and internet users are connected to the most popular and advanced provider - Babilon-T. Its famous CyberZONE package is designed for the most demanding customer. Paying $15.89, you get access to the Internet at a speed of 2,048 kb/s or more. This tariff plan, like many others, is meant for home users/individuals. By selecting one of the above optimal packages of Internet service providers, you can install the Voip gateway 32 port and terminate traffic, making about $1,000 a month at first stages.